Wall Clock by Robert Fletcher of Chester | Antique Clock Sales. 16" diameter white dial with Roman numerals and original hands. 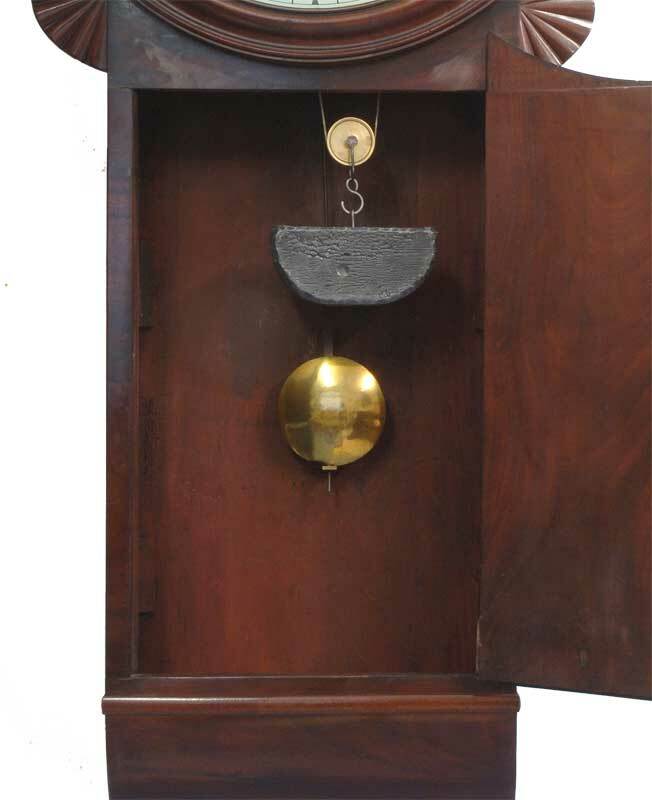 Single lead weight as the clock is a non-striking timepiece. Falseplate by Finnemore & Son, Birmingham. Mahogany with flame figured door and bone escutcheon. Fan ears to sides of case. Inverted dome base to take lead weight. Robert Fletcher II was born 1755, granted Freedom in 1841 and died in 1841. He was the son of Robert Fletcher I, who died in 1788. Robert Fletcher I is mentioned in Chester's first and second directories. He made a mechanism for the Duke of Westminster for his home at	Eaton Hall and was also a goldsmith. The Chester Courant of 7 July 1789 records a move to Foregate St and the same paper on 16 October 1810 records the hanging of two young men at the New Gaol at the Northgate for a burglary in the shop of	MR FLETCHER, watchmaker in Chester. Mr Fletcher did all he could to get the sentences reduced. Sales and Restoration of Antique Clocks.